Florida Book News: New Book Release! 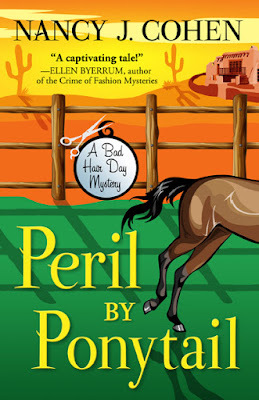 PERIL BY PONYTAIL (#12 in the Bad Hair Day Mysteries) by Nancy J. Cohen launches on September 16. 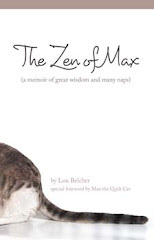 New Book Release! PERIL BY PONYTAIL (#12 in the Bad Hair Day Mysteries) by Nancy J. Cohen launches on September 16. Hoping for a romantic honeymoon at an Arizona dude ranch, Marla and Dalton arrive to find a series of mishaps plaguing the resort. A nearby ghost town is suffering similar problems. Is it a coincidence that Dalton’s uncle owns both properties? The stakes rise when a local forest ranger is found dead. With her new family in jeopardy, Marla dusts off her crime-solving skills and saddles up to find the culprit before someone she loves is hurt. Besides sharing and retweeting her posts, below are some ways you can help spread the word. Follow her Blog Tour on Sept. 14-20: http://bit.ly/1KJ69uC Author interviews, Guest Posts, Reviews, and Giveaways.